Prezi WP is a simple plugin that adds a [prezi] shortcode to your WordPress blog. Prezi WP was developed for the CUNY Academic Commons (see: https://dev.commons.gc.cuny.edu/2011/02/03/new-wordpress-plugin-prezi-wp/). Go to the Dashboard of your blog. Click on Plugins tab in the left navigation area. Type the word “prezi” into the search bar in the upper-right corner and click Search Plugins. The Prezi WP plugin should appear at the top of the page, select activate to enable this plugin. Once the plugin is activated you can use the code below to embed it into your WordPress blog post or page. Want to share a PDF or PPT document with your readers without having to send an attachment via email? The Simpler iPaper plugin is an effective way to add a document to your blog posts or pages. You can quickly and easily embed a document into your post and share information with your readers without having to re-create your work. If you save the draft and can preview the post with the embedded document (screenshots of the CUNY Academic Commons) then you’re good to go! 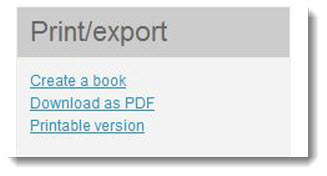 Go to Scribd.com, sign into your account, then navigate to the document that you would like to embed. Once the document is loaded, navigate to the ‘Share and Embed’ tab on the right side of the page and select ‘Embed’. A “Share this Document” screen will pop up. 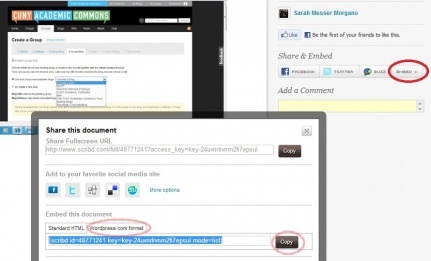 Scroll down to “Embed this document”, select ‘WordPress.com format’, and ‘Copy’. Go to your WordPress dashboard and edit your post or page. Paste the code you got from Scribd.com into your post or page. The Widget Context WordPress plugin provides extra control over sidebar widgets. Documentation is indeed limited, but the plug-in does work and is really useful, despite the frustrations voiced in the above-mentioned thread. After installing the plugin, there are no additional controls on the dashboard. Go to Appearance >> Widgets and select a widget which you want to control. If the plug-in is installed correctly, you should see an additional panel drop down when you select the widget. In this example, the widget was only displayed on a page with a url that ended in “about/prezi-test”. You may choose to hide the widgets as well. And you may add several urls, on separate lines. There are a lot of options to choose from here, and they may require a little tinkering, but this plug-in can be really useful. An alternative is to use the Woo Themes, which allows you to customize the sidebars for each page or post. “Google Gadgets” are little code snippets created by Google and third parties which may be embedded into your blog. A complete listing of available “Google Gadgets” is provided in the Google Gadget Directory. Widgetize Google Gadgets is a WordPress plugin that makes it easy for you to include these little apps into any widgetized area your theme provides. There are gadgets that create customized search engines which only look in the domains you choose. There are gadgets that provide weather forecasts, quotes, jokes or poems of the day. Some gadgets simply provide themed slideshows. The New York Times gadget provides a configurable tabbed feeds of the day’s news. There are over 200,000 gadgets to choose from, and the list is growing daily. Google has developed a standard “Google Gadgets API” (Application Programming Interface), and these gadgets can be created quickly. Some, especially the ones created by Google, unfortunately include advertising. Find a gadget in the directory. This list is enormous, but Google (being Google) provides a robust method of searching for what you want. There are many which are not very appealing, or don’t work – this step is probably the most time-consuming. Configure you widget. Follow the directions. You may need to resize it so that it fits where you want it to go. Choose the border that you want to surround it. Finally, copy the code that is automatically generated. On your WordPress dashboard, go to Appearance>>Widgets. Find “Google Gadgets” and drag it to one of your available widgetized areas available. Provide a title if you want (totally optional), and paste the code which you copied in Step Two into the appropriate area. Click save, and you should be good to go. EmbedVideo does not recognize the video service “vimeo“. Planning a meeting with colleagues? Writing about a geographical area unfamiliar to your readers? Announcing a conference? The Google Maps Embed plugin is an effective way to add geographical information to your blog posts or pages. You can quickly and easily embed a Google map and provide directions to an event or highlight a unfamiliar area. Go to Google and search for a map of the place your want to embed in your blog. Adjust the zoom appropriately. Copy the url. Paste in the url (from Step One), click “Okay,” and you should see your map embedded. You may also go to “Settings” to change the default dimensions and scroll option for the screen above if you find that your prefer different settings. The Media Element HTML5 Player WordPress plug-in is an HTML5-based audio and video player which is compatible with all today’s modern browsers, and with their older versions, and which works on the iPad, iPhone and Android. The player supports many of the major file formats, including MP4, Ogg, WebM, and WMV for video and MP3, WMA, and WAV for audio. After activating the plugin, you simply add shortcodes in a post or page to embed the player. There are parameters which control the way the player behaves. For example, you can pre-load the video, adjust the skin, make it play automatically, or make it repeat. For more information about the parameter controls, click here. Again, a number of parameters control the look-and-feel of the player and they can be found by following this link. This is a nice plug-in that ensures your video and audio clips are accessible on all browser platforms. Limitations – source from video hosts like YouTube or Vimeo don’t work. The Commons allows uploads of up to 48 MB – fine for most audio and short videos. Have fun playing around with this newly installed plugin! Widgetize Google Gadgets is a WordPress plugin that makes it easy for you to include these gadgets in any widgetized area your theme provides. There are gadgets that create customized search engines which only look in the domains you choose. There are gadgets that provide weather forecasts, quotes, jokes or poems of the day. Some gadgets simply provide themed slideshows. The New York Times gadget provides a configurable tabbed feeds of the day’s news. There are over 200,000 to choose from, and the list is growing daily. Google provide a standard Google Gadgets API (Application Programming Interface) so that these gadgets can be created quickly. Some, especially the ones created by Google, also include advertising. Find a gadget in the directory. This list is enormous, but Google (being Google) provides a robust method of searching for what you want. Here you see all the widgetized areas available. Drag the “Google Gadgets” icon to your widget area, give it an optional title, and paste the code into the appropriate area. Planning a meeting with colleagues? Writing about an area unfamiliar to most readers? Announcing a conference? The Google Maps Embed plugin is an effective way to add geographical information to your blog posts or pages. You can quickly and easily embed a Google map and provide directions to an event or highlight a unfamiliar area. Go to Google and search for a map of the place your wish to highlight. Adjust the zoom appropriately.Copy the url. Paste in the url and click save, and you should see your map embedded. Click on tne green button to go into book creator mode. Once in book creator mode, the following widget will be available on each wiki page. Click on the green plus sign to add a page to your collection. As you begin adding wiki pages to your collection, remember that you can create chapters and move pages around by dragging and dropping them in different sections. There are two output methods available for collections created on the Commons Wiki. You may create an actual soft cover book through PediaPress which will be created within two days and mailed to you (this option costs you money), or you can simply create a PDF, which may be uploaded to a website or emailed to an interested group. Individual wiki pages can simply be downloaded by clicking on “Download to PDF.” If you only want to download one page, this is the option for you!